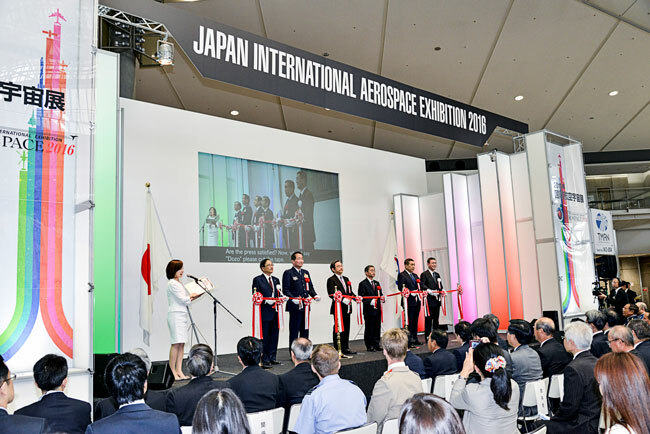 The British public may have voted for Brexit in June 2016, but British industry used the Japan International Aerospace Exhibition to underline its strengths and commitment to long-standing overseas partners and markets. Held at the Tokyo Big Sight convention centre on 12–15 October last year, eight British firms had booths in the UK pavilion—beneath banners proclaiming “Innovation is Great Britain” and alongside images of spacecraft, helicopters, fighter aircraft and airships. Meanwhile, Rolls-Royce Holdings plc and BAE Systems plc operated large stands to showcase their products and strengths. The firms are all members of the Aerospace Defence Security Group, Ltd., which was formally created in September 2009 to advance the interests of British firms in a sector in which the UK is the second-largest player in the world, behind the United States. “The UK has an approximately 14% share of the global aerospace market and reported an annual turnover of £31bn [in 2015]”, said David Scotter, director of events and market development for the London-based group. Productivity in this sector of the British economy saw growth of 7% between 2008 and 2013, significantly outstripping the rest of the economy, he pointed out. “British firms are involved in all aspects of the aerospace sector, but we are particularly strong in a number of areas, such as wing technology, propulsion systems and advanced systems such as landing gear, actuation, avionics and fuel and power supplies”, Scotter explained. The UK is also a world leader in advanced helicopters and has a deserved reputation in the areas of maintenance, repair and overhaul of aircraft. Taking the Boeing 787 as an example, Scotter pointed out that well over a dozen UK firms provided components or systems, including engines from Rolls-Royce, seats in the first class and business compartments from Zodiac Seats UK, and fuel pumps and valves manufactured by Eaton Aerospace. Given the importance of the sector to the overall economy, the British government has unsurprisingly been generous in its support for aerospace firms. And it is working closely with them to safeguard the industry for the next 20 years, Scotter said. Under the public–private initiative Means of Ascent, some £385mn is being invested in research projects, including £137mn in universities, while bursaries are being offered for masters qualifications, as well as funding for a further 3,000 apprenticeships. Additional efforts, and funds, are being earmarked for advanced research and development projects, improving the supply chain and the creation of seven high-volume manufacturing centres across the UK. 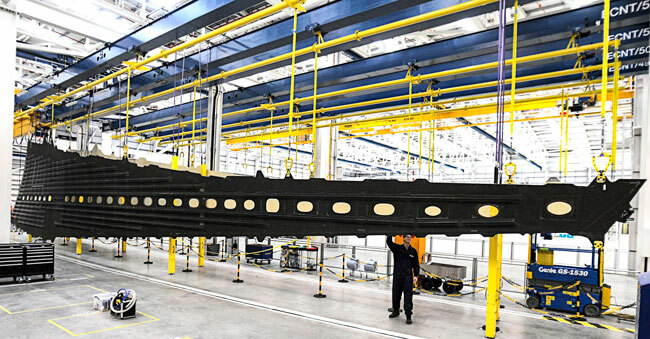 Inside the £400mn Airbus S.A.S. wing factory at Broughton in Wales. The world’s leading aerospace firms now see the UK as an increasingly competitive environment for investment, with Rolls Royce, for example, investing in a new composite technology hub in Bristol, while Airbus S.A.S. has opened a £400mn wing factory in Wales. In all, an estimated 115,000 new jobs will be created in the aerospace sector by the start of the 2030s, Scotter added. Yet, inevitably, there has been a degree of concern among the UK’s partners about the possible impact of Brexit on the sector. “We understand from our engagement with Japanese businesses so far that many people are keen to see rapid progress and understand what a post-Brexit UK will look like”, said Esther Williams, first secretary and head of trade at the British Embassy Tokyo. Up until the completion of procedures for the UK to leave the European Union (EU), which will, barring special circumstances, take two years from the invocation of Article 50, “We remain full members of the EU and will continue to make the case for free trade”, Williams said, adding that the UK also remains committed to supporting the EU–Japan economic partnership agreement, which saw its 17th round of negotiations in September. “While we cannot at this stage speculate on what it may look like, we will try to find the best possible arrangement for trade in goods and services with the EU, and we will also try to ensure ongoing trade and investment with our partners outside the EU”, she said. “The negotiation process will not be brief or simple, but our aim is to be as transparent with the Japanese government and [Japanese] businesses as possible, and to ensure there are no surprises”, Williams added. Already there have been some very positive signs that UK–Japan business partnerships will not be seriously affected by the fall-out from Brexit, with Nissan Motor Co., Ltd. committing to producing a new generation of cars in North-East England and Softbank Group Corp. completed the acquisition of technology firm ARM Holdings in September. “The UK government’s role is to maintain our strengths while building an even stronger relationship with the EU and its partners, including Japan”, Williams said. “The relationship between the UK and Japan has gone from strength to strength in recent years, and will continue to do so”, she added. The Rolls-Royce Trent XWB-97 propulsion system is used in the Airbus A350-1000.